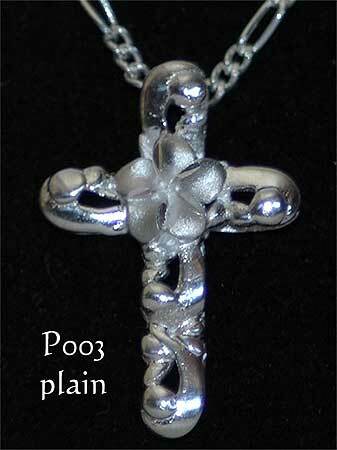 Sterling silver Hawaiian jewelry design cross. Features cut out Hawaiian scrolling pattern with a central 7mm diameter sanded finish Hawaiian Plumeria (frangipani). Petal edges are diamond cut. Also available with a central eye of clear cubic zirconia. Pendant is 25mm drop, 17mm wide.